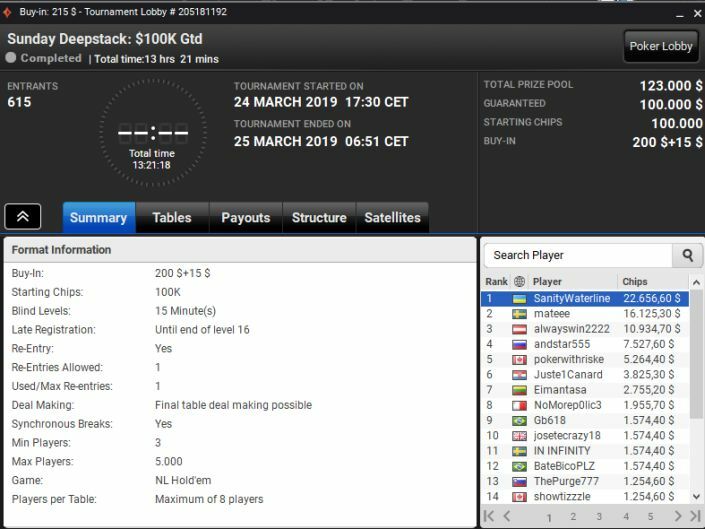 Kicking off with the Sunday High Roller Deepstack, the $1050 buy-in event drew 195 runners, the final table featuring a few Canadians in the mix, as well as a timely Brazilian appearance at the higher online stakes. 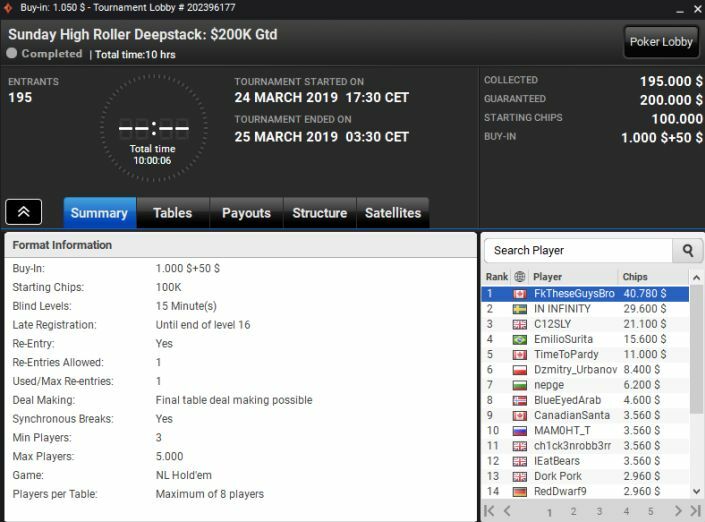 Emilio Surita managed a 4th place finish and $15,600, outlasting partypoker pro Dzmitry Dzmitry_Urbanov Urbanovich (6th for $8400) but it was Alex FkTheseGuysBro Foxen proving his online game is as good as his live beast performances. Seeing off Sweden’s IN INFINITY heads-up saw Foxen walk off with a $40,780 payday, a healthy $29,600 heading to Swedish shores as runner-up. Popping down a level or two for the $215 buy-in, $100k guaranteed Sunday Deepstack, there were 615 runners chasing an eventual $123k prizepool. The as yet anonymous IN INFINITY was on a roll, although his 11th place finish couldn’t quite match his podium placing in the $1050 version of the deepstack. Another Swede stepped in to replicate that 2nd place finish however, mateee facing off with the number one online MTT player in the world, Roman SanityWaterline Romanovsky. Romanovsky just this week replaced Niklas Lena900 Astedt at the top of the online rankings, the Swede having held that spot for an astonishing 44 weeks! Another Sunday, another win for the Ukrainian as he took the $22,656 top prize yesterday, looking to cement that top spot in style. Next up we have the $1050 Sunday High Roller Bounty Hunter, 221 entries adding $25k to the $200k guarantee – and a winner who can boast two WSOP gold bracelets in live play! Elio donzledurbru Fox burst onto the live scene with a takedown of the 2011 WSOP Europe – a $1.87million payday that he matched again last summer with a 2nd spot in the WSOP $100k High Roller. Online MTT’s have proved slightly less successful for Fox over the years, but yesterday he showed his class, chopping the regular prizefund of $34k with Dutch pro JgsNV and scooping $24k in rakefree bounties along the way! The ‘half-price’ version of the Sunday High Roller Bounty Hunter once again broke the guarantee by a significant margin, 461 entries paying $530 apiece to chase $236k, with half and half regular and bounty prizepools to whet the appetite. Dzmitry Dzmitry_Urbanov Urbanovich was well in the mix again, representing his partypoker sponsors in good fashion and taking a 3rd place worth $16,500 in total to add to his earlier 6th spot. That left Danish online MTT crusher Beeeetelgeuse to fight it out for top spot with mwhldwn and he eventually secured the victory – $23k in bounty payments making it a $40k payout in total. Leaving the biggest buy-in till last, the $200k guaranteed Sunday High Roller Gladiator costs a hefty $2100 to enter, but with 118 entries there was an extra $42k in the kitty and a host of big names chasing it. Dario madgenius87 Sammartino was among them, as was Elio donzledurbru Fox, having another excellent run. However, nobody could stop Thomas onehundredeyes Mühlocker from scooping the lion’s share of the cash on offer, a heads-up victory over the UK’s SpiritDNA bringing him a $33k bounty bonus on top of the $22k or so regular prizemoney – a $55k total the best of the big Sunday grind. That’s it for another week from the partypoker highstakes online MTT world, but we’ll be back again next Monday for another roundup – and in the meantime the partypoker LIVE festival in Rio de Janeiro has plenty to offer fans of the game!